Articles and information related to anxiety in children, adolescents, and teens. Being the parent of a child struggling with anxiety and fear can be overwhelming, scary, and confusing. With so many options available, where should you turn to help your child? 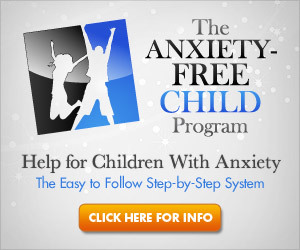 We HIGHLY recommend you learn more about and consider the award-winning Anxiety Free Child Program. It’s already been used by thousands of people just like you all over the world to help their children overcome their anxiety, and we’re confident it can help you and your child too. The program was developed with a Doctor of Clinical Psychology, is tailored for simple and easy use with children, has been recommended by parents and professionals, is completely natural, and is backed by a 100% money back guarantee. A New Kind of Anxiety Disorder? Anxiety disorders come in many different forms. Everyone experiences some anxiety, especially in stressful situations. But can your way of life actually be causing you unnecessary grief? Find out what you may be doing that can make you feel more anxious. Do you have questions about Post-Traumatic Stress Disorder? Looking for good resources from around the Internet which can give you more information on the condition? If so, you should come read this article which will answer your questions in a straightforward manner. People with asthma sometimes experience an attack when they are feeling highly emotional. This may be one reason why people with asthma see a worsening of symptoms if they also suffer from an anxiety disorder or depression. Read more about it here. The Best Way to Treat Panic Disorder? People who have panic attacks usually find them debilitating enough to seek treatment for them. But just what kinds of treatment actually work? Some people advocate the use of prescribed medication to correct the biological problem that can trigger panic attacks. Others swear by therapy. Read one interesting perspective here. Gaming with OCD: Is It Good or Bad? The debate about whether video gaming will necessarily lead to unhealthy behaviors has been going on for years. Can video game violence eventually turn into real life violence by players? Are people with a mental health illness more likely to be affected by video gaming? Read what a gamer with OCD has to say about it. OCD is a serious and all-consuming illness. Even children can find themselves caught in the unhealthy and seemingly relentless patterns that are a major part of an obsessive-compulsive's life. It seems that OCD is becoming more and more common, which has led researchers to question: What causes OCD? Read about the latest findings here. Anxiety in Kids: What are the Options? Many parents of anxious children are concerned about getting the best possible treatment for their kids. They wonder about the short- and long-term effects of an anxiety problem. How will having an anxiety disorder affect a child's social life? What about his or her development? Find out what you want to know here. Going to the dentist can be a major source of stress for parents and children alike. It's important for parents to teach their kids how to handle visits to the dentist in with as much maturity and calmness as possible. Find out how to do that here.